​​​SO MANY GREAT THINGS YOU CAN DO WITH GOAT'S MILK. ​I have only just started with some of the wonderful projects ​with goat's milk. 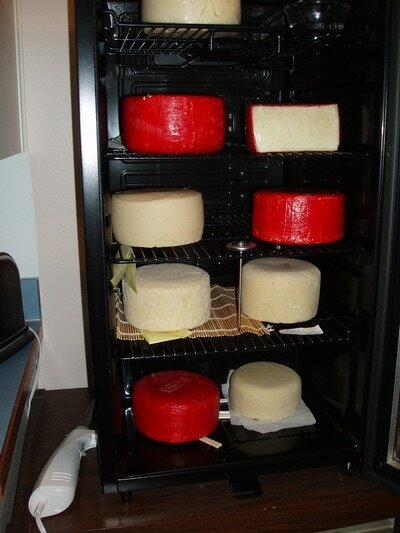 Have always made yogurt, cream cheese(chevre) and buttermilk but now have started on more advanced cheeses. It is fun and rewarding and had to purchase a cooler just for the aging of it. I purchased a book by Ricki Carroll "Home Cheese Making" and it gives you lots of directions for many cheeses. The New England Cheese supply has all of the cultures and equipment that anyone could want. Plus they have a monthly email with recipes and lots of hints. Some cheeses I have waxed and other are a natural rind. 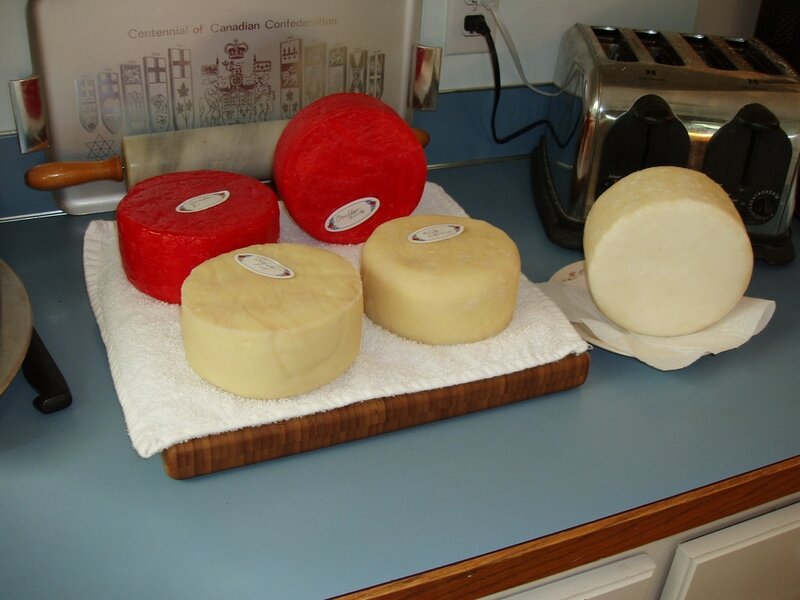 ​Have had very good results with Italian cheese, cheddar, swiss and jack - will try more next milking season. One of our favorite cheeses is called Quedo's -from Ricki Carroll's book. Some of my cheese all waxed and ready to age. I am trying waxed, natural rind and will see what works best, So far waxed seems the best if we are keeping it long. It dries out too fast with the natural rind. Found a beverage cooler seems to be a good aging cave - have it in the kitchen where we see it all the time so remember to turn cheeses. Tom smoked some of the Italian cheese for me - it turned out so good. ​GOAT MILK SOAP - A good way to use extra milk. Tom and I made soap years back when I used to go to the Black Sheep Gathering as Winding River Fiber. Maybe some of you remember me from that time - I had the Patrick Green carder and a picker and processed fleeces for spinners. 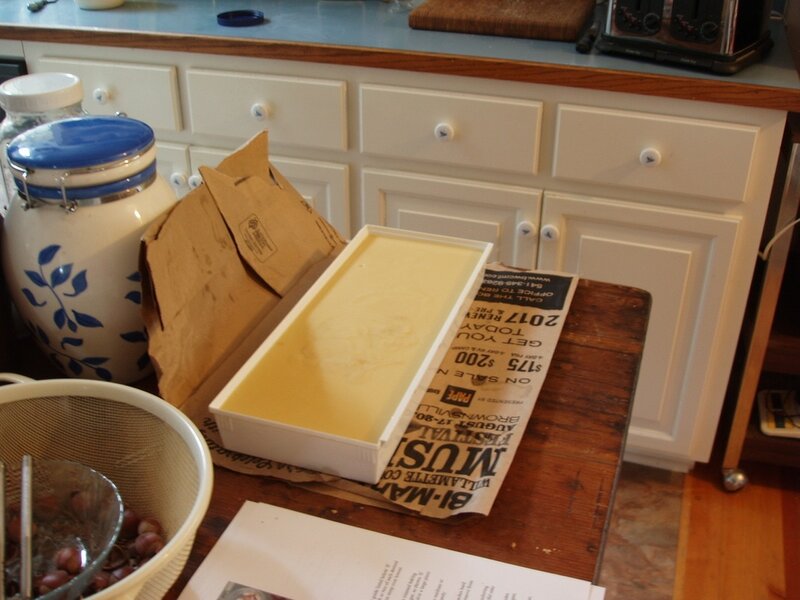 We always made our soap from sheep tallow, olive oil and a few other oils. ​I now am making it from goats milk, and some of the special oils and butters. So far am getting pretty good results and will keep trying new recipes. 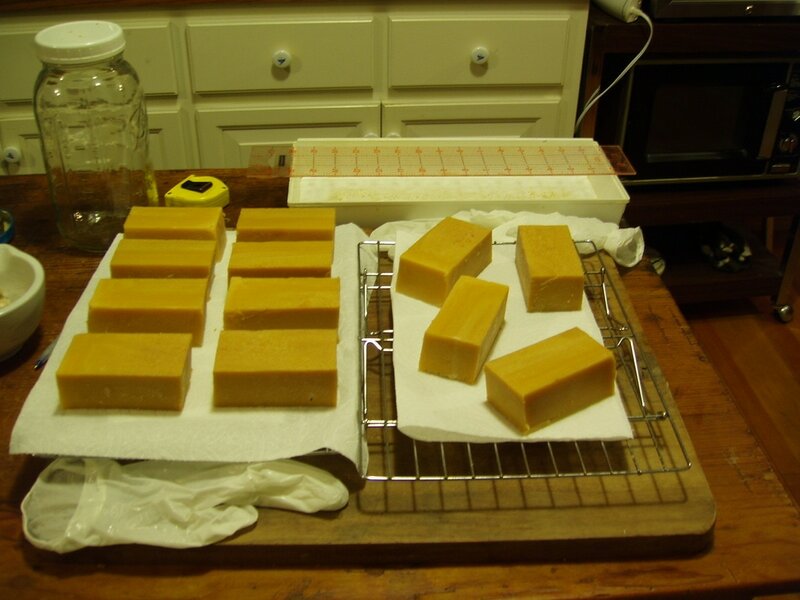 This is a batch of soap - will have to age for 6-8 weeks to be at it's best. Smells good. It is natural colored. I havel never use coloring in my soaps or cheeses so far. I prefer the natural color. My second soap batch is lighter cream color so I am guessing that the fats used play a big part in that. As I perfect my own recipes I will put them on this page.